We've been writing together for a very long time. Let's just say for more than 10 years, but fewer than 1,000. The single most consistent question we field is, "How do you manage to stay married and still work together?" Deb usually gets a little poetic and talks about how much we know and honor our individual strengths, how much we trust each other and how well we communicate through our differences. Brad's response is more straightforward: "Separate offices, preferably on separate floors of the house." Ouch. Even so, the single most effective trick we've found is to assign a "lead" editor for each project. Then, when the inevitable disputes arise, we each defer to the opinion of the lead editor. It works every time. We figured, if we've found effective coping techniques, then, certainly eBay sellers, who so often include the whole family in the business, must have found some, too. We set out to gather wisdom from the trenches and see just how these family businesses—and these families—continue to thrive. We spoke with a variety of eBay sellers, from those now operating big eBay businesses to the ones who still keep it small and in the family. The responses were universal, and yet—as families tend to be—unique, too. Andy and Deb Mowery, operating on eBay as debnroo, started working together almost by accident. Andy Mowery's dad operated an antique store. He'd been hearing from his colleagues in the antique business about this place to sell collectibles called eBay. Andy's dad had virtually no computer experience at the time, so the couple set up an eBay account to help him sell a few items for far more than they would have brought at his store. In 1999, when this occurred, such a thing was revelatory. The couple went back to their home, more than 1,000 miles away, and started to sell Dad's paper goods because they were easy to ship and manage. Skip and Karen McGrath actually began their eBay business because of the success they watched their son enjoy. "Our teenaged son started selling comic books on eBay," Skip McGrath explains. "We had previously closed down a small antique shop and had boxes of small antiques and collectibles in storage. I listed some 19th century candlesticks, and they sold for more than they used to in our shop. That was the start of our business." Liza and Margaret, a mother/daughter team that operates preciouspiecestwo on eBay, have come to employ Liza's brother and dad in the 10 years since they began operating their business. Starting, again, with collectibles, these two switched to clothing when they saw the profit margins were better and the inventory easier to acquire. Today, Liza's brother operates the men's line of clothing. Over the years, they've learned to split the work according to tastes and talent. For example, Liza now handles writing all the descriptions. At first each woman operated her own eBay account. But, when Margaret realized that Liza was selling her items at a higher volume, she had to admit that Liza wrote better descriptions. With the writing turned over to Liza, Margaret found a new niche. "She took on taking all of the pictures and measuring all the items," Liza says. "She calls out the numbers to me, while I add them in. It is hard to do with just one person. My mother also has to steam all of the wrinkles out, before [photographing] the items. I add in every single item. I also take care of all of the relisting, running of special sales and making everyone do a full inventory about every three months." What tasks are left for Dad? "My father is computer incompetent," Liza explains. "He has always been the shipper. He also hangs up all of the stock and pulls most of the items that sell." The McGraths also find that dividing the labor is very important to sustaining a successful family/business partnership. "If you want to avoid conflict, each of you should have different responsibilities," Skip McGrath advises. "For example, if you both write listings, you will always do it differently. And you will never agree about the best way to do it. But if one of you does the listings and the other person is responsible for photography, then you are not competing." Barbara Freundlich and her husband sell jewelry on eBay as auelox2. They agree that it's important to have clearly defined roles, but Freundlich adds another twist to the equation: "Make sure that everyone knows exactly what their job is, but also make sure that everyone knows how to do the other's job in a pinch," she advises. Keeping in mind that tasks will change as the business evolves, this redundancy makes good sense. "My husband has always taken all the photographs," Freundlich explains, "but as the business grew, he took over all the financial aspects of the business. I do the buying, the listing, the packing and shipping, the communicating, etc." We've been writing about eBay long enough to know that many of the most successful business on eBay began almost as a lark. Someone heard about the site, or a friend showed it to them, and the business that resulted came about almost by accident. Soon after they began their eBay business, the Mowerys realized that they would need to find products beside the paper collectibles Andy Mowery's dad could provide. Today, more than 10 years later, they sell home, garden and pet supplies. They have successfully completed nearly 65,000 eBay transactions! Of course their business has changed a lot during these years. "We now have an operations manager who handles all listing data, as well as ordering from suppliers, logistics to the warehouse, and oversees other employees who handle Web design, customer service, and inventory control," he says. "We also have outside contractors who deal with many specialized tasks including programming, data entry and computer maintenance." But, the accidental nature of their start was quite literal for these two. Skeptical at first that eBay could provide the money they'd need, Deb Mowery went to interview for a job as a waitress to ensure a steady cash flow. "As she stepped out the door, she twisted and sprained her ankle," Andy Mowery recalls. 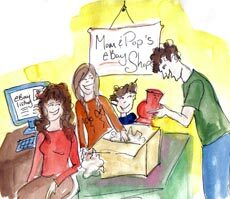 "Unable to walk well, she was in a way forced to put more energy into our fledgling eBay business, and we found that with both of us putting effort into it, it grew even faster. So, it's not a stretch to say that our working together was literally started by accident." Next time, we'll look at how these eBay sellers have adapted their evolving businesses over the years, the challenges they've overcome, and more advice they can offer to those who are putting the whole family to work in order to follow in their footsteps. I have been on Ebay for 5 years and find it is more hit and miss than anything else. One month I'm in the hundreds and the next month I'm scraping by. I would tell anyone don't quit your day job till you know you can fly high and cover the bills. I've enjoyed reading all 3 of your articles. Being a homebased business with at times 3 children around has been a challenge. Thank you for sharing and letting me know I am not alone. Wonderful article! My husband and I operate an online business full time mostly selling on eBay so I can relate. It's an amazing life and one we are happy to be enjoying. Say what you want about eBay but it is an avenue that provides as amazing way to make money while working from home. And that is pretty great! Adapt your online offerings to attract shoppers at the holidays, and all year long. So You Want to Make Money on eBay? Follow these tips to help focus your efforts and achieve success. Take your venture to the next level with these tips from the experts.